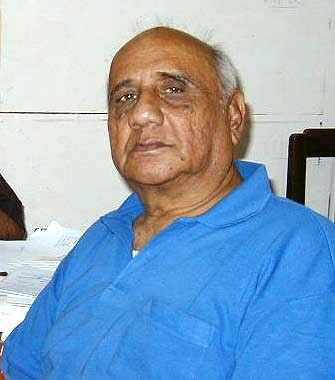 Nilkant "Jikaka" Bhatt passed away suddenly at his home in Rajkot, Gujarat, India on Sunday, 6 July, 2003. I remember him as a friend who was a gracious and outgoing gentleman with a ready smile. Always a wonderful host, he showed Rita & I around Rajkot, helped with logistics (for example, my attempt to transfer money to India for the Assisi-Downs Earthquake Relief Fund), and generally did his best to see that we were happy. During my return visit in January and February, 2001, Jikaka and I spent many hours together, often sitting on the swing in his living room where he told (and retold) stories about the time he spent working for the United Nations in New York, about the cement shortage and the construction of the second floor of his house (for Sheela's family), and about the more recent extended train trip around India that he and Benifaiva had taken with Sheela. We would walk together to the Ashram where he arranged for me to see everything and meet everyone. After the earthquake when I was working for the Ashram in Rajkot, he would make my breakfast each morning, and be waiting for me when I returned home each evening. Here are some additional pictures of Jikaka.